The incident happened at the Orlando Regional Medical Center, shown here in 2016. "At some point while he was in the hospital, he told hospital staff that he had a gun and that he would shoot anyone who came near him," Mina said. Negotiators came to talk to the man, Mina said. "He made a lot of statements about how it's going to end right here today. He also made statements about being the suspect in some homicide; we're still trying to track that down," the officer added. 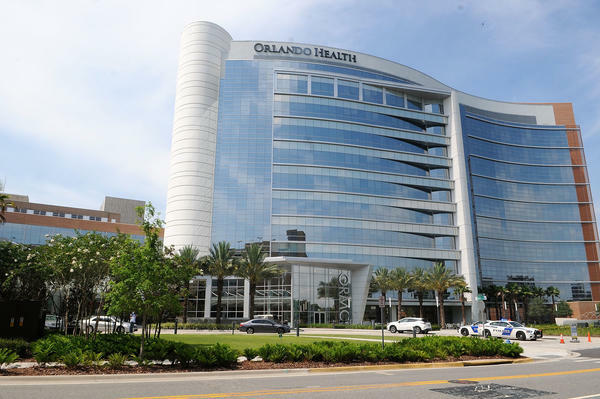 The emergency department was on lockdown, according to a tweet from Orlando Health. Mina said that officers decided to approach the man, because "there were patients close by that needed care." "He made movements consistent with pulling, reaching for a firearm and he was shot and killed by three officers here," the police chief said. The department has not released the man's identity, pending notification of his next of kin. Those officers have now been put on paid administrative leave, and the Florida Department of Law Enforcement is going to investigate the shooting. "A woman named Sandy, who declined to provide her full name, said she was in the emergency room with her daughter when she heard someone say he had a gun," according to the Orlando Sentinel. "She said police asked to see his hands and then cleared the hallway." Nobody else was injured, and Mina praised hospital staff for "containing the subject who claimed to be armed."